Removing the ground-seeking tree. Photo by MBTA. 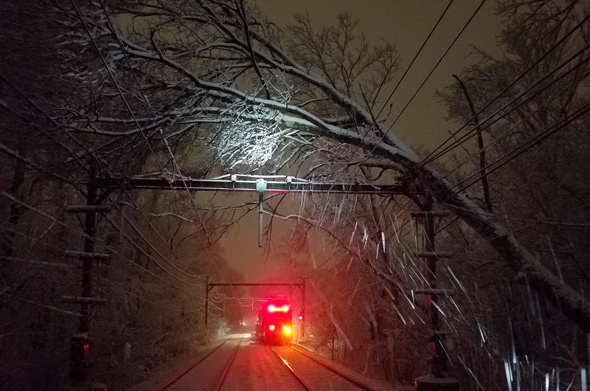 The MBTA had to run shuttle buses between Kenmore and Reservoir after a tree fell on wires that run along the tracks this morning. 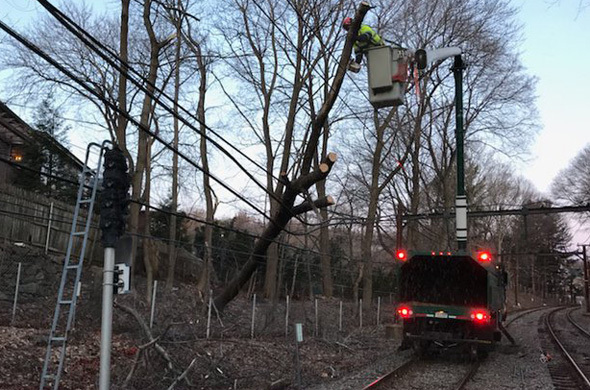 At 8:43 a.m., the T reported the tree had been cleared, the wires had been fixed and regular trolley service had resumed. 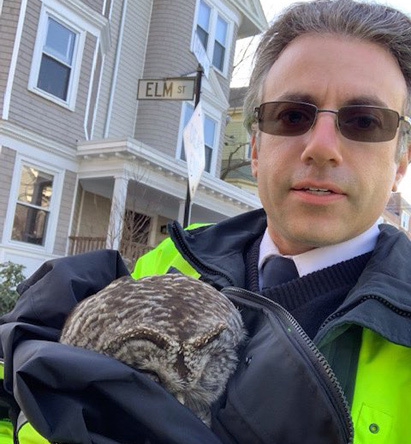 The MBTA reports delays on the Riverside Line due to an injured owl caught between the tracks at Brookline Hills, but that a worker safely removed Hooty and handed him over to the town's animal control officer. Transit Police report arresting a Somerville man for assault with a dangerous weapon for an incident this morning that started at the Riverside Green Line station, then continued on an inbound trolley. Read more. As Orange and Red Line riders wearily await new cars, some Green Line riders got to spend time today on one of the new trolleys on that line. Alex Cox boarded the new trolley on its first day in service on the Green Line today. It's one of 24 new trolleys coming online to add capacity for that fabled day when the Green Line Extension opens past Lechmere. 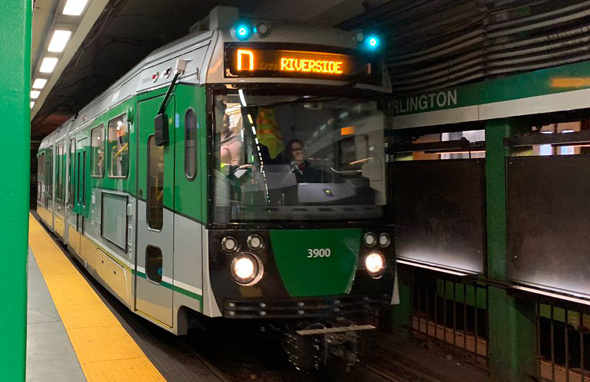 The MBTA will hold a drill inside the Riverside Line's tunnel between Kenmore and Fenway stations between 8:30 and 10:30 a.m. on Sunday: Read more. Currently on an inbound Riverside train that's "standing by until further notice" just outside Beaconsfield "due to two disabled trains ahead". Transit Police report arresting a homeless man who sometimes lives on a boat in Boston Harbor for sexually attacking a woman on a trolley at Reservoir on Aug. 26. 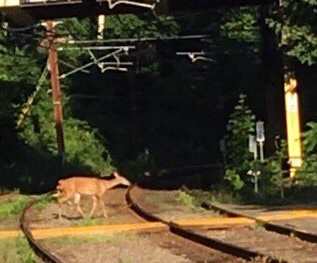 MassDOT's Jacquelyn Goddard fawned over this deer crossing the Riverside Line at Chestnut Hill this morning (it didn't try to get on a trolley because it was short a buck). The MBTA reports an inbound Riverside Line has a "power problem" at Newton Centre, which is causing 20-25 minute delays. Tree stopped the Riverside Line. Photo by MBTA. Buses are running along the Riverside Line this morning after a tree tried to plunge to the ground early this morning only to be stopped by overhead wires. The C and E lines had issues, too, if not of the tree variety. Read more. 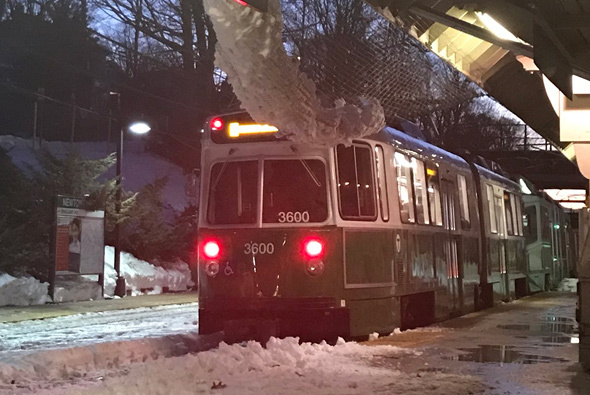 A tree that fell on the Green Line tracks between Brookline Village and Brookline Hills means the T is now busing people between Fenway and Reservoir. The MBTA reports "minor" delays on the Riverside Line inbound due to a dead trolley at Beaconsfield. The MBTA reports "moderate" delays on the Riverside Line due to a trolley that just will not budge at Newton Centre. There were delays on the Riverside Line due to a trolley that gasped its last at Government Center, but the MBTA assures us things are hunky dory there again. A Green Line trolley left this vail of tears at Brookline Village and now there are "minor" delays on the Riverside Line, the MBTA reports. It's down! It's up! It's down again! The MBTA reports it is rounding up buses to shuttle C Line riders between Kenmore and Cleveland Circle and D Line riders between Kenmore and Fenway because of the same sort of power issues that plagued the line earlier this morning. Huge pile of snow just melted and fell off the roof and onto the tracks at Newton Centre outbound. T tried to push through it but got stuck. The MBTA reports "moderate" delays on the Riverside Line due to a trolley now due a proper burial near Eliot. The MBTA reports "minor" delays on the Riverside Line due to a deceased trolley at Kenmore Square. The MBTA reports "minor" delays on the Riverside Line due to a flatlined trolley at Waban.